Our environment pollution strongly requires our additional protection on the cell level. Even if you consume fresh fruit and vegetable grown at your back garden you must remember that their nutritional qualities such as percentage of microelements and other useful substances is very low and can’t compensate natural deficit. 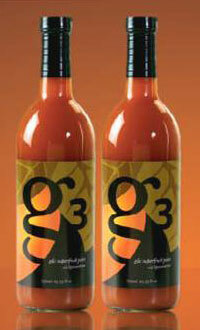 Our Super Juice G3 is created for those who care about their antioxidant protection. It’s a mixture of juices from 4 super fruits with the most phitonutrients percentage. A team of scientists from Pharmanex have examined many different fruits. Lee Tai Wong, a professor from California University suggested that they should study the qualities of an exotic fruit from her country of origin Vietnam. She mentioned that this fruit was traditionally given to kids to keep them growing strong and healthy and to cure vision problems. Research was carried out to confirm that this reddish fruit is extremely rich in carotenoid antioxidants. Scientists continued their research in hope to find other fruits that could be mixed with the gâc to enrich its curing properties. So three other super fruits were chosen. One of them is Chinese Lycium, small red berries with extraordinary anti-oxidant properties. Second fruit is Siberian Pineapple. It is known to be part of astronauts’ menu to protect them against solar radiation. And the last but not the least fruit is Cili, a mountain plant that grows in China. This outstanding fruit contains 60 times more vitamin C than the orange. Having combined these super fruits Pharmanex created its wonderful cocktail G3. We can keep ourselves healthy only if our level of antioxidants is high enough. If your diet is reach in phitonutrients, if you eat many fruits and vegetables it will keep you away from many different diseases. According to the last data provided by the Nutritionist council 80% of us are very well aware of healthy diet principles but only 20% really follow them. Using our Biophotonic Scanner Pharmanex can really open your eyes and help you change approach to your health and your life style in general.